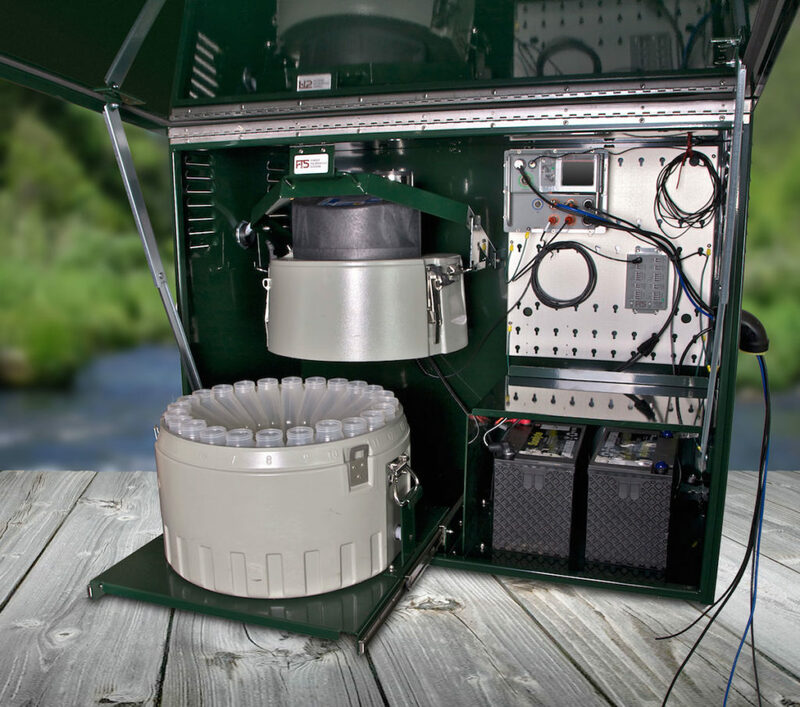 SedEvent is a turn-key system based around the effective Turbidity Threshold Sampling method, for intelligent, automated sampling that measures suspended sediment concentrations (SSC) and requires no programming to install and maintain. The ability to collect useful data about sediment transport and other pollutants has been dependent on the timing and frequency of manual grab samples during run-off events, if personnel, time and support are available for a site visit. Other automatic samplers can trigger many unnecessary samples, so that the limited supply of sample bottles can be expended, or nearly so, before the critical point of storm event. The 24-bottle capacity of our SedEvent System, coupled with our threshold sampling algorithm, ensures only event samples are taken and in sufficient quantity to provide reliable data. SedEvent eliminates the need for expensive manual grab samples during unpredictable storm events and lab analysis costs are minimized as only storm events are analyzed. A complete, turnkey system. Install it and start collecting data immediately. Reduced lab analysis costs. An autosampler without a threshold sampling algorithm takes many non-event samples that yield no sediment. SedEvent takes only the samples that count. No programming required. Any technician, regardless of skill or training, can be successful with operating and maintaining the system. No complex wiring. Color-coded, keyed connectors. All components are interchangeable and field swappable—just disconnect, plug the new one in. Easier maintenance, greater reliability. Built-in, customizable, event-driven, turbidity threshold sampling algorithm is ready to go as soon as the datalogger is powered on. No need to program or hire expensive consultants. Extreme ruggedness. Watertight, corrosion-resistant, positive-locking connections. No exposed electronics. Three levels of lightning protection. Even a waterproof touchscreen. Reliable data in any climate or weather condition. Accuracy that just can’t be achieved with manual sampling or even continuous turbidity monitoring. One-stop support. A fully integrated system from a single supplier offers a single source for obtaining support and service. A fixed site can be configured with any other digital and analog sensors required. Hats off to the engineers for building such foolproof and repeatable equipment. The DTS-12 has been very reliable for us and can take a beating. The SedEvent turbidity is reliable, rugged, and designed with the end user in mind. "We purchased the SedEvent turbidity threshold sampling system over 4 years ago and have had nearly flawless performance. The equipment is reliable, rugged, and designed with the end user in mind. This is literally a "turn-key" system that allows my field staff to concentrate on the field work, rather than troubleshooting the electronics." We have been able to reduce the number of technicians needed significantly. "I find the DTS-12 to be superior for measuring turbidity. We have been able to reduce the number of technicians needed significantly." Our new GOES units performed flawlessly last summer and winter. “Our new GOES units performed flawlessly last summer and winter including only one power-related dropout (likely a frozen battery) so it appears that the overall power consumption is much lower than it was with our MSAT units. Kudos to you and your team for a great product!" I really appreciate your efforts to help lower our cost. Your Service is Better than the Rest! FTS equipment has been highly reliable. FTS DTS-12 saves us about $2,000 per instrument, per year in maintenance costs. "We have no drift, no expensive instrument calibration and no changing of instruments with the DTS-12. We estimate that this step alone saves us about $2,000 per instrument, per year in maintenance costs." We are impressed with FTS service and product quality. “You are the BEST (and FTS rules). By the way, all the techs are VERY impressed with FTS service and product quality." I have been impressed by the customer service provided after the purchase. "I have dealt with FTS for the past 12 years and have always been impressed by the customer service provided after the purchase. I would not hesitate to recommend FTS to anyone." FTS’ products are vastly superior in every aspect of data collection and equipment maintenance. Their SedEvent System was worth the extra cost. "For me the decision to go with FTS was based on whether buying the integrated SedEvent system was worth the extra cost. It was."